Satoko - International iPhone Repairs Service From Japan - Most Trusted IPhone Repair Specialist. Iphone 3GS/4/4S/5/5c/5s, IPAD 2/3/4, Mini, Air, IPod Touch 4. Nobody can fix it? Bring It On. When iPhone Specialists got the email from Japan a few days ago, we thought it's kidding. How come!! a customer wanted to send her iPhone from Japan. However finally we got this via EMS. please check the photo above. Absolutely, we did our best to solve her iPhone problem and sent it back to her at the same day - we received. We couldn't believe this from the other side of the earth~~. 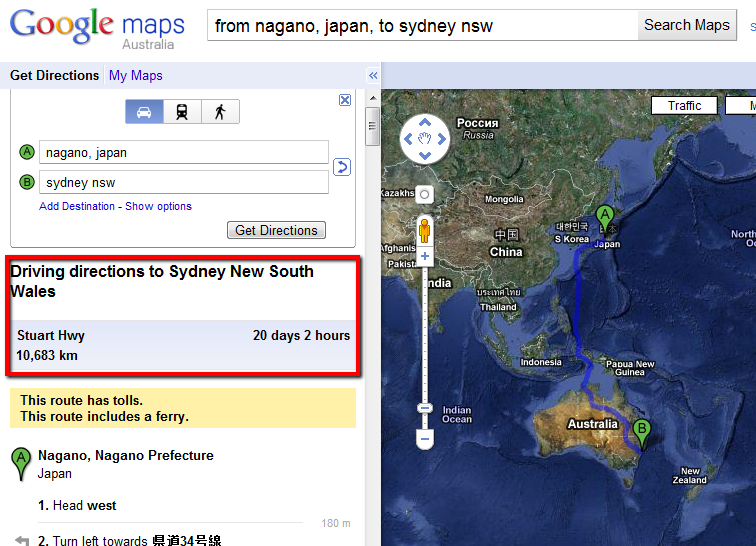 We just checked the distance from nagano, Japan to Sydney, Australia. it's 10,683km distance and according to Google maps, it takes 20days 2hours by car. Yes, it's like a joke but it happened to iPhoneSpecialist.com.au . and we asked her to take a video testimonial but she was shy to come up on video. it's fine. check her letter. You gave us another aspect of our business. Now we don't limit our iPhone repairs Services within Sydney. iPhone Specialists' skills and services are toward the World. "Nobody can fix it. Bring it on!" Contact The World Best iPhone Specialists right now.